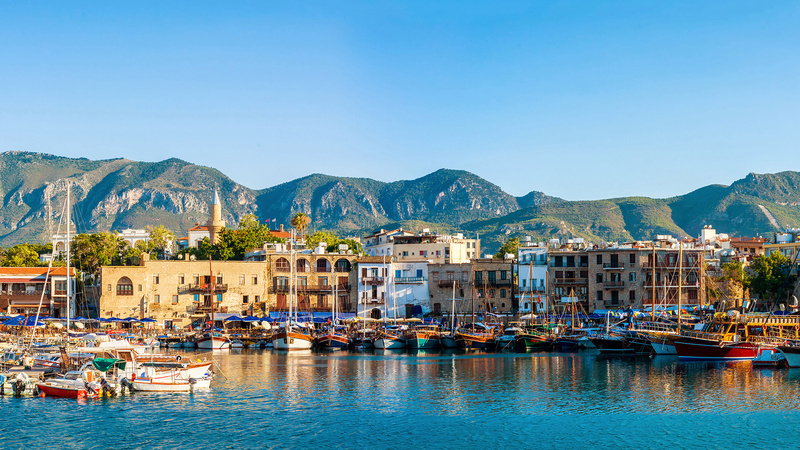 Dancing yachts, fishing boats, waterfront cafés, pastel coloured houses and a powerful castle... this is Kyrenia Harbour. Elegant yachts bob and dance at their moorings, waterside diners pause from their mezes occasionally to watch the comings and goings of the boats or just admire the sturdy castle guarding the port entrance. Looking onto the harbour are old carob warehouses, now mellow stone restaurants, and boutique hotels. This is colourful Kyrenia, the star attraction in North Cyprus and one of the prettiest ports in the Mediterranean. Kyrenia castle stands guard over the port entrance as it has done for centuries. It‘s believed to have started life under the Romans but there is little evidence left today of the original structure. At the beginning of the 7th century AD during the Byzantine rule, the Arab caliphate mounted repeated and devastating raids on Cyprus forcing the Byzantines to strengthen the defences of Kyrenia castle. The raids finished with an agreement to allow Muslims to settle on the island. Further improvements and additions were made when the Lusignans seized the castle in 1191. It was the Venetians who built the really thick walls evident today and turned it into a powerful fortress. It was never taken by force or suffered bombardment leaving a substantially intact castle to look around. The castle is open daily throughout the year and there is a small charge for entry. Visitors enter over what was the original moat but now dry. St George’s chapel lies down a passage to the left on entering. This 12th century Byzantine chapel, its ancient columns with Corinthian capitals, originally stood outside the walls until the Venetian reconstruction enclosed it within the walls. A ramp used for wheeling artillery up to the Venetian round tower is the start of a circuit around the walls. The view down over the harbour is quite stunning from the walls, quite the best viewpoint. Looking further afield the close proximity of the Kyrenia mountain range, also known as Besparmak, can be appreciated. There is also a Lusignan dungeon to visit with not too realistic dummies illustrating torture victims and prisoners. One of the highlights of exploring inside the castle is the shipwreck museum. The wreck preserved here is believed to be the oldest in the world. It sank just outside Kyrenia harbour some 2,300 years ago and was found by a local diver at a depth of 30m in 1967. Hundreds of wine amphorae were recovered from the wreck suggesting it was most likely a cargo ship plying down the coast of Anatolia visiting islands such as Samos, Kos and Rhodes.